Archaeologists and anthropologist back in the day (say around the later Victorian era and the early 20th century) had it easy in terms of research and methodologies. Study subjects and specimens were abundant while strict and standardized methodologies were not. Researchers just went out and both literally and physically grabbed data. They weren’t data necessarily that they needed, but data they wanted. Many times, collection techniques were…less than completely ethical, but as has been the long trend in human history, we learn from our mistakes. As data collection becomes thankfully more regulated by ethics committees and conversations with indigenous communities becomes the norm, there has been an increasing demand to squeeze as much data out of already collected artifacts (and in my case, human skeletal remains). This desire to see what else these objects and bones can tell us has benefitted immensely via a symbiotic relationship with improved technological and digital advances. After initial studies of objects, they are sometimes rarely studied again and just sit on shelves collecting dust or are placed in boxes and put in dark and forgotten corners. This more-or-less extinguishes their ability to continue their narrative as some researchers feel that little more information can be gained from them. However, the massive leaps forward in digitization of cultural and biological objects within the past decade have completely altered data collection techniques of the future. As I have discussed in previous posts, the research potentials of photogrammetry (creating 3D models out of a series of photos) has been a game-changer here at MSU in the way we study skulls by mapping 3D landmarks. However, we implemented another use for photogrammetry this past summer in the field. We created photogrammetry models of our excavation units which give better definition than just pictures and help us to physically look at the physical relationships of objects to each other and to surrounding features. Not only does this digitally preserve our excavations, which have permanently altered the landscape, but it also allows us to go back and possibly make new interpretations upon a second viewing of the artifacts. Screenshots from a 3D model of a bone cluster covered in flowstone from the cave site of Actun Chanona, Belize. Another big initiative in the past few decades has been for more open access to data and excavations and to bring in the general public into the conversation. We are interacting peoples’ pasts and ancestors, so it is our duty to give them the information we uncover (bad um tss). Free and public digital spaces, such as Sketchfab, allows the general public to access worlds and cultures in a three-dimensional manner when in the past, they would have to be content with maps in research reports. Sketchfab is a free and open-source 3D modeling venue where users can easily navigate and view anything that people have made 3D models of. For example, the discovery of England’s Richard the III in 2012 prompted international media attention (Buckley et al. 2013). However, without access to scholarly sources and few public sources that showcased specifics, the general public had to imagine what his burial space and skeletal remains looked like. 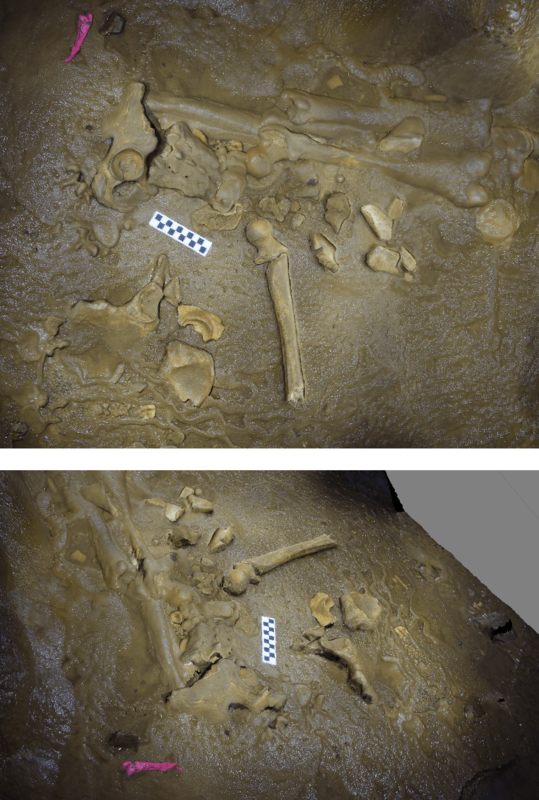 The archaeological team that uncovered him created a photogrammetry model and hosted it on Sktechfab, giving everyone the opportunity to see for themselves how the excavations took place and what the burial of an early English king looked like (Pappas 2016). I know that I’ve discussed photogrammetry and 3D modeling before at nausea, but its potential cannot be overstated. Along with scholarly research comes the responsibility to communicate our findings back to the public. Using 3D models (or other forms of visualization) gives people from all over the world the chance to look at, rotate, and manipulate these objects in digital space. Descriptions of objects are okay – we get the general idea. Drawings and sketches are helpful to contextualize. Photos are good to give us more context and help us understand the scale and details of the objects. Yet digital models make the artifact much more visceral; you can imagine yourself on the side of Richard III’s burial looking in and seeing it from different angles. You can see yourself holding and moving ceramic vessel in your hands as you rotate the model on the screen. It allows scholars to get digital data and gives the public not just more information; it gives them an experience. Newer doesn’t always mean better. But in this case, the recent strides that have been made in 3D modeling make it easier than ever to not only create models, but to share those models with a wider audience, bring them into the conversation, and give people an experiential relationship with something that may be on the far side of the world. Buckley et al. 2013. ‘The king in the car park’: new light on the death and burial of Richard III in the Grey Friars church, Leicester, in 1485. Antiquity, 87: 519-538. Thank you for sharing this–very interesting. I’ve used it to update some draft class notes on how archaeology is changing.